My husband and I are among a growing number of users implementing grassroots remote/second screen monitoring of blood sugar values, trends, and patterns. It's called CGM in the Cloud. I have a lot to share about this concept in the coming months. Expect to see an interview with Hubster about the changes he's made to the existing framework that will allow for future wearable tech, our favorite blood sugar pattern management apps, and even future CGM technology that's coming down the pike to provide us our data in different formats. It's my data. If I can see it in a format I can understand and I can make inferences from it, I can manage my numbers better. I've been seeing higher numbers creep up on me first thing in the morning. My fasting blood sugar has been "floating the rumble line" as I call it and twirling itself around my upper threshold. If I forget to bolus insulin for my morning coffee, I'm riding much higher by breakfast. Many mornings, if I look back, I might notice that my numbers stayed steady in a safe-for-sleeping range followed by a gradual bump midway through the night. That bump is a bit murky for me sometimes. Hard to see the time, the values, the minutiae. I'm supposed to be able to dive into that data and evaluate what could be changed. Otherwise I wait three months of seeing this over and over again before discussing it with my diabetes educator or my endocrinologist. One of them will lean toward the screen and stare at a tangled mess of lines and determine the same thing I should be able to determine myself...if I examine the data in a way that makes sense to my brain. Do you know what makes sense to my brain? Numbers. 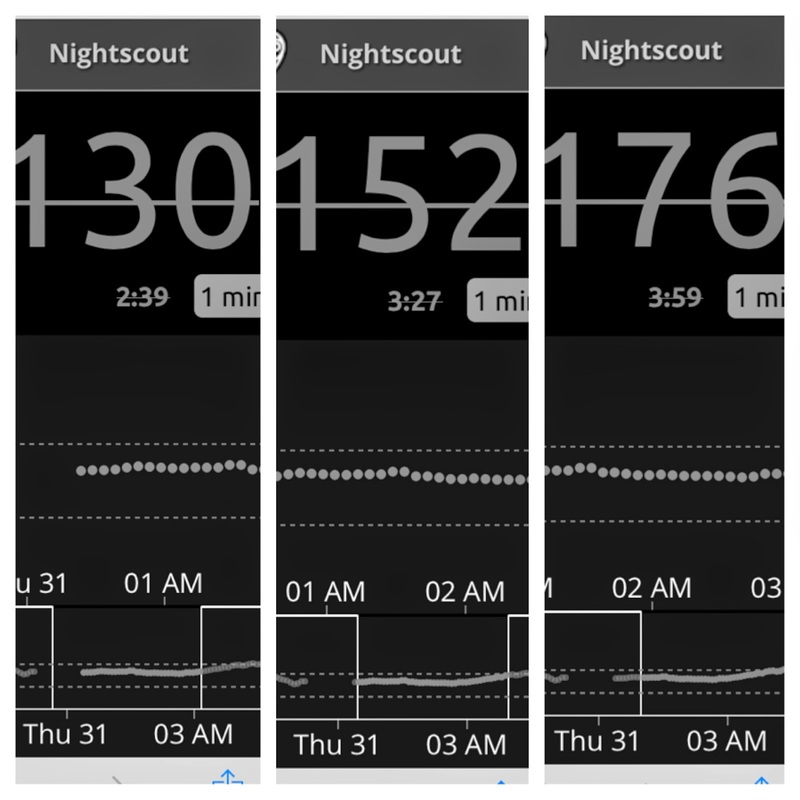 Using Nightscout, I can scroll through my night and pinpoint exactly when I had my first out-of-sync data point because I can see the numeric values and they are timestamped. At 2:40am, the first reading that wasn't between 129 and 132 popped up: 134. Not concerning in and of itself. 25min later at 3:05am, it was 139. Again, not worth a great deal of worry. Except at 3:14am, 144. 3:27am, 152. 20min later 174. By 4am, 176. This is how a blood sugar creeps. This is taking SMBG (self-monitoring of blood glucose) to an empowering point. I am not manipulating my data. I'm understanding the language of my data. You have a story. You have a voice. Both are unique and powerful. FDA wants to hear our stories. Although I am a huge Dexcom fan and have been using it for 4 years, I do miss the ability to scroll back through actual numbers the way I could with Medtronic. Very interesting post because I didn't think that I would find much value with Nightscout at this point in my life. Laddie, I feel much the same way in the way I miss Freestyle Navigator. I could scroll through days upon days of graphs and see trends (not to mention information about my standard deviation and averages) on the handheld receiver without uploading to the software. It didn't timestamp data points like this, and it didn't show you the graph on the same screen as the number and trend arrow (which I find invaluable), but it did let me see more than just the last 24 hours on the receiver. I probably upload to Dexcom studio once every 3 months the night before the endo. On Navigator, I was much more aware of my time in range and my standard deviation with it right in front of me. 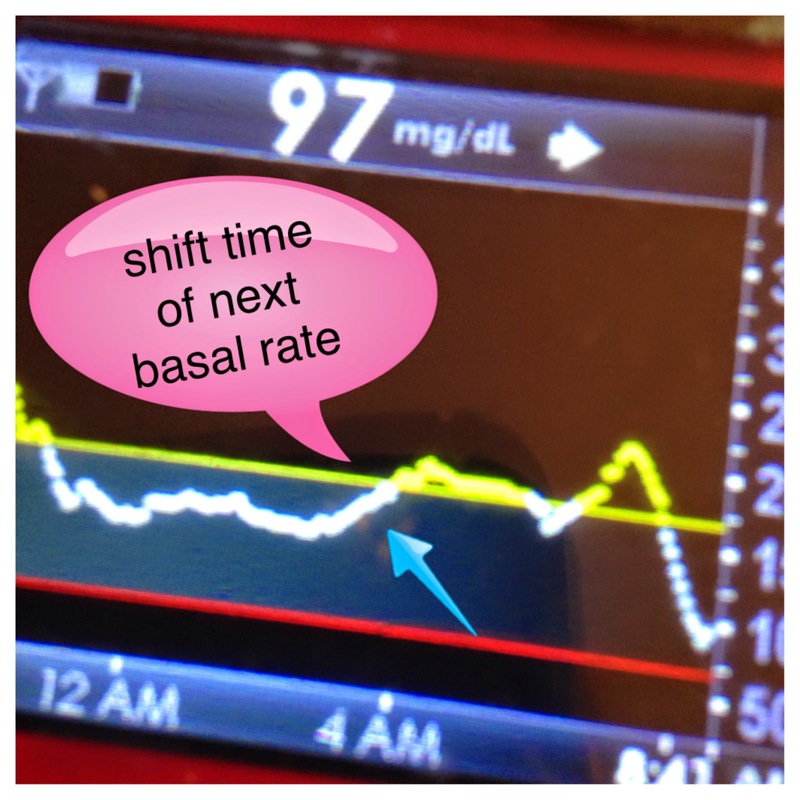 I've been shifting basals using the Dexcom line graph and would find a numerical list so helpful! I don't even have the tools to download my data (yet), so I'm working on a combination of the current graph + hand-written notes. I've been wanting Night Scout ONLY BECAUSE it is a new thing cool people are using. I didn't have much of an idea of how I'd use it, other than watching BG's when my person is out on his bicycle or at a friend's house. Now I know another reason to want it! Katy, it's access like this that could allow Bubs's whole Dexcom graph to get uploaded into your favorite mobile management apps or fitness trackers so that you could lay out pump data and cgm graph data and calories burned and heartrate etc for a quantified self picture. For pediatric use, of course it's a huge deal to be able to remotely monitor, but think what this could do for you when sonny boy leaves for college. Or the kind of peace of mind it could give my husband while I'm out for a run (<---haha) or if I'm home alone with the babies. This is so huge. The remote monitoring alone is exciting. But the ability to more precisely make adjustments is every bit as important to our management. I've got the parts. I just need to set it up! Hi... just got to read this. Thanks for sharing this. People and parents who are managing diabetes know how important this is. Now we just have to let the rest of the world know.